I started my career with Siemens® Canada as a student, supporting outages and the engineering department. I hold a Mechanical Engineering Technology diploma from Niagara College and a Mechanical Engineering Degree from Carleton University. Following my education, I continued with Siemens® including one year in their UK engineering office. In 2008 I accepted a position with Reliant Energy as a turbine specialist responsible for their fleet of turbines in Ohio and Western Pennsylvania. I joined the MD&A team in 2012 shortly after visiting and being impressed with the shop. What do you do here at MD&A? I reside with the Bearings, Seals and Hydraulics Division (formerly RPM) in Euclid, OH. 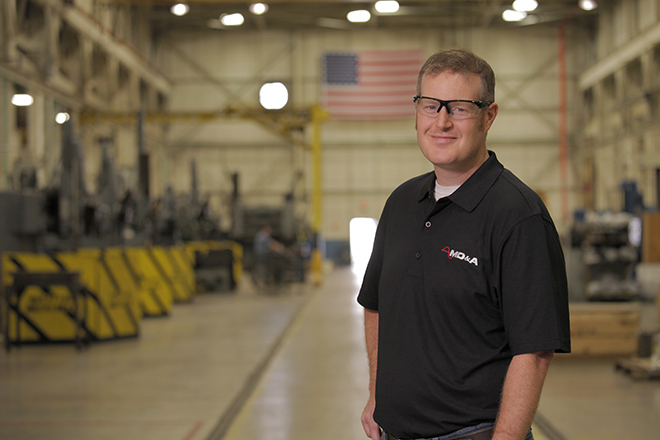 I am one of two product service engineers at our facility, specializing in the centerline equipment (bearings, oil seals, hydrogen seals, oil deflectors). I’m responsible for these components through the inspection and repair process. Most often, I am balancing between providing engineering support to production and communicating closely with customers to understand their needs. What is the most interesting challenge you have come across at a job site or in repair shop? It’s difficult to choose just one. Every component that passes through the shop seems to bring a new challenge to the table. Turbines are very good at that. One recent project that comes to mind is a pair of hydrogen seal housings we received from a nuclear plant. The request was for us to modify them to accept babbitted steel, bolted hydrogen seals from the original unbolted bronze seals. There were a lot of meetings, drawing reviews and processes that needed to all come together to make the project a success with high customer satisfaction! What is oil whip or oil whirl in regards to journal bearings? How does MD&A Bearings, Seals & Hydraulics help? Oil whirl develops when the wedge of high pressure oil formed under the rotating shaft, lifts the rotor up toward the top of the bearing. The high-pressure oil wedge whirls around the bearing causing the shaft to whirl around the bearing as well. Oil whip occurs when the frequency of oil whirl coincides with the natural frequency of the shaft. There are several conditions that can induce oil whirl. We are committed to working closely with our customers to understanding the nature of the problem; whether it be oil whirl or not, so that the right solution is achieved. How has the new shop location impacted your work flow? The new shop has dramatically impacted our work flow. We’ve recognized efficiency gains in all departments. The additional space has also allowed us to install new equipment and machines to help us work smarter. Most importantly, the new facility offers more space for each task and each individual. This creates a safer work environment and gives morale a boost as well. What is your favorite thing in your office? Although I love the tools, instruments and parts that tend to clutter my desk; I would have to say my favorite thing is a photo of my kids. I don’t have to look far to be reminded why I do what I do and what is truly most important. Contact Wes today using our Contact form.